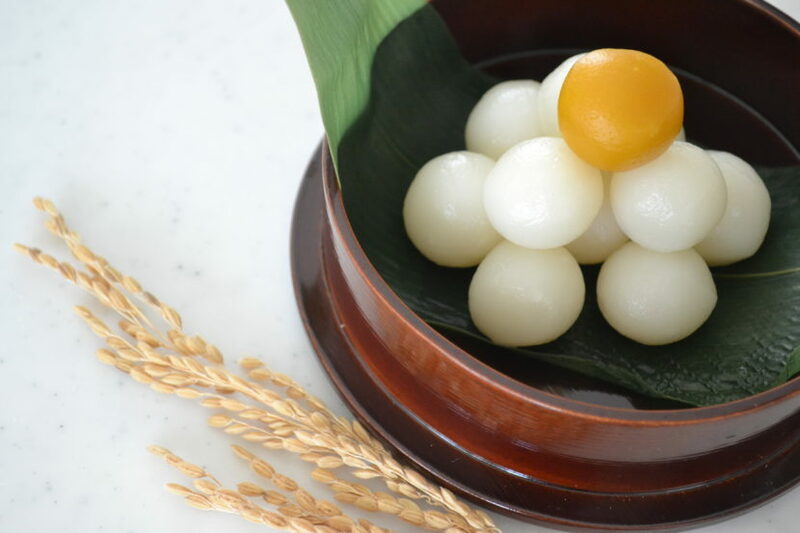 Today, I will introduce you to “Tsukimi-Dango,” rice cake balls for the “Tsukimi”, Japanese Moon-viewing. On August 15th of lunar calender, it is 4th of October this year(2017 ) we enjoy watching moon. The moon of this day is considered the brightest moon for the entire year. Here is an interesting story about Tsukimi in Ikoma city, Nara prefecture, where I live. On the day of Tsukimi, children allow stealing Tsukimi Dango at anyone’s home. These children are called “Tsukimi Dorobo” which means “The Moon Festival Thief”. This tradition continues more than thousand years since Nara was the oldest palace city in the 8th century. People prepared a lot of treats besides Tsukimi Dango in front of the house to get easily. It’s just like a Halloween in America! Free-stealing on a specific day is considered to be releasing peoples stresses. Ruling class thought there would be less serious problems in the society. I grew up another area, so I was so surprised at this tradition. A lot of recipes for “Tsukimi Dango” to be seen in these days. My recipe is easy to keep its perfectly round shape and so delicious! Read the recipe and check out the video! 1. Bring water to a boil and dissolve sugar and salt. 2. Turn off the heat and add in rice flour and glutinous rice flour. 3. Mix to distribute the liquid evenly. If the dough looks too dry, do not add water. 4. Transfer to the working surface and knead until smooth. It doesn’t seem comes together, but it will soon form a sticky dough. If the dough is too sticky to handle, add rice flour as much as you need. But not too much otherwise the final product would become hard. Set aside and cover with plastic wrap. 5. Cut some dough out and mix with pureed kabocha squash. Add rice flour just until the dough doesn’t stick to your hand. 6. Before shaping the dough, line the parchment paper on the bamboo steamer. Cut the parchment paper along with the diameter of a bamboo steamer. Fold into a triangle, and fold two more times, and cut with scissors like a piece of the pie. Cut out several tiny halls, and open. You will have a perfect parchment paper fit to your steamer. Shape the rice cake into ball. And line them up in a steamer. 7. Steam on medium heat for 15 minutes. Before transfer to a tray, let it cool for a while. 8. Pile up nicely like this. We offer them to the Moon before eating with pampas grass. I used ears of rice because I couldn’t find it. How pretty are these! How we eat “Tsukimi Dango”? I will show youthree ways! First, light brown sugar and regular soy sauce. Probably this is the most simple way, and you have the ingredients in your kitchen. So simple and hearty, the taste reminds me of when I was little. Second, red bean paste. You can buy it in a can at Asian super market. Red bean paste is considered as taking off evil spirit. Last but not least, matcha syrup. Mix same part of matcha and powdered sugar and add boiling water to dissolve. Slightly bitter and not too sweet. Goes well with bouncy rice cake ball so much! Simple but flavorful. I will eat my kabocha rice cake ball with… soy sauce and sugar!